Piraeus (/paɪˈriːəs, pɪˈreɪ.əs/; Greek: Πειραιάς Pireás [pireˈas], Ancient Greek: Πειραιεύς, Peiraieús, pronounced [peːrai̯eús]) is a port city in the region of Attica, Greece. Piraeus is located within the Athens urban area, 12 kilometres (7 miles) southwest from its city centre (municipality of Athens), and lies along the east coast of the Saronic Gulf. According to the 2011 census, Piraeus had a population of 163,688 people within its administrative limits, making it the fourth largest municipality in Greece and the second largest within the urban area of the Greek capital, following the municipality of Athens. The municipality of Piraeus and several other suburban municipalities within the regional unit of Piraeus form the greater Piraeus area, with a total population of 448,997. Piraeus has a long recorded history, dating to ancient Greece. The city was largely developed in the early 5th century BC, when it was selected to serve as the port city of classical Athens and was transformed into a prototype harbour, concentrating all the import and transit trade of Athens. During the Golden Age of Athens the Long Walls were constructed to fortify Athens and its port (Piraeus). Consequently, it became the chief harbour of ancient Greece, but declined gradually after the 4th century AD, growing once more in the 19th century, after Athens' declaration as the capital of Greece. In the modern era, Piraeus is a large city, bustling with activity and an integral part of Athens, acting as home to the country's biggest harbour and bearing all the characteristics of a huge marine and commercial-industrial centre. The port of Piraeus is the chief port in Greece, the largest passenger port in Europe and the second largest in the world, servicing about 20 million passengers annually. With a throughput of 1.4 million TEUs, Piraeus is placed among the top ten ports in container traffic in Europe and the top container port in the Eastern Mediterranean. The city hosted events in both the 1896 and 2004 Summer Olympics held in Athens. The University of Piraeus is one of the largest universities in Greece. Funerary relief for a girl, flanked by her parents (330/320 BC); Archaeological Museum of Piraeus. Piraeus, which roughly means 'the place over the passage', has been inhabited since the 26th century BC. In prehistoric times, Piraeus was a rocky island consisting of the steep hill of Munichia, modern-day Kastella, and was connected to the mainland by a low-lying stretch of land that was flooded with sea water most of the year, and used as a salt field whenever it dried up. Consequently, it was called the Halipedon, meaning the 'salt field', and its muddy soil made it a tricky passage. Through the centuries, the area was increasingly silted and flooding ceased, and thus by early classical times the land passage was made safe. In ancient Greece, Piraeus assumed its importance with its three deep water harbours, the main port of Cantharus and the two smaller of Zea and Munichia, and gradually replaced the older and shallow Phaleron harbour, which fell into disuse. In the late 6th century BC, the area caught attention due to its advantages. In 511 BC, the hill of Munichia was fortified by Hippias and four years later Piraeus became a deme of Athens by Cleisthenes. According to the ancient Greek historian Thucydides, in 493 BC, Themistocles initiated the fortification works in Piraeus and later advised the Athenians to take advantage of its natural harbours' strategic potential instead of using the sandy bay of Phaleron. In 483 BC, a new silver vein was discovered in Laurion mines, which was utilized to fund the construction of 200 triremes, the Athenian fleet which was transferred to Piraeus and was built in its shipyards. The Athenian fleet played a crucial role in the battle of Salamis against the Persians in 480 BC. From then on Piraeus was permanently used as the navy base. After the second Persian invasion of Greece, Themistocles fortified the three harbours of Piraeus and created the neosoikoi (ship houses); the Themistoclean Walls were completed in 471 BC, turning Piraeus into a great military and commercial harbour. The city's fortification was farther reinforced later by the construction of the Long Walls under Cimon and Pericles, with which secure port's (Piraeus) route to Athens main city. Meanwhile, Piraeus was rebuilt to the famous grid plan of architect Hippodamus of Miletus, known as the Hippodamian plan, and the main agora of the city was named after him in honour. As a result, Piraeus flourished and became a port of high security and great commercial activity, and a city bustling with life. The Long Walls connecting the ancient city of Athens to its port of Piraeus. During the Peloponnesian War, Piraeus suffered its first setback. In the second year of the war, the first cases of the Athens plague were recorded in Piraeus.In 429 the Spartans ravaged Salamis as part of an abortive attack on the Piraeus, when the Athenians responded by sending a fleet to investigate, the Spartan alliance forces fled. In 404 BC, the Spartan fleet under Lysander blockaded Piraeus and subsequently Athens surrendered to the Spartans, putting an end to the Delian League and the war itself. Piraeus would follow the fate of Athens and was to bear the brunt of the Spartans' rage, as the city's walls and the Long Walls were torn down; the Athenian fleet surrendered to the victors and some of the triremes burnt, while the neosoikoi were also pulled down. As a result, the tattered and unfortified port city was not able to compete with prosperous Rhodes, which controlled commerce. In 403 BC, Munichia was seized by Thrasybulus and the exiles from Phyle, in the battle of Munichia, where the Phyleans defeated the Thirty Tyrants of Athens, but in the following battle of Piraeus the exiles were defeated by Spartan forces. After the reinstatement of democracy, Conon rebuilt the walls in 393 BC, founded the temple of Aphrodite Euploia and the sanctuary of Zeus Sotiros and Athena, and built the famous Skeuotheke (arsenal) of Philon, the ruins of which have been discovered at Zea harbour. The reconstruction of Piraeus went on during the period of Alexander the Great, but this revival of the town was quashed by Roman Lucius Cornelius Sulla, who captured and totally destroyed Piraeus in 86 BC. The destruction was completed in 395 AD by the Goths under Alaric I. Piraeus was led to a long period of decline which lasted for fifteen centuries. During the Byzantine period the harbour of Piraeus was occasionally used for the Byzantine fleet, but it was very far from the capital city of Constantinople. In the Middle Ages, the port was usually called by the Venetians the "port of Sithines" (that is, of Athens) and in the 14th century, the name "Lion" is first attested, after the colossal ancient sculpture of a lion, the Piraeus Lion, which stood at the harbor's entrance. This later become Porto Leone (Πόρτο Λεόνε). It was also called Porto Drako (Πόρτο Δράκο) by Greeks, drako meaning not just "dragon", but any monster. When Piraeus was taken by the Ottoman Empire in 1456, it became known as Aslan Liman ("Lion Harbor"), a translation of the existing Venetian name. The Piraeus Lion itself was looted in 1687 by Francesco Morosini during his expedition against Athens (part of the Morean War) and was carried to the Venetian Arsenal, where it still stands today. A copy of the lion statue is on display at the Archaeological Museum of Piraeus. Under Ottoman rule, especially before the beginning of the Greek War of Independence, Piraeus was mostly deserted, except for the monastery of Saint Spyridon (1590) and a customs house, and it was only used occasionally as a commercial port. Although there were numerous land owners, Athenians did not live in the area. The customs office of the port of Piraeus in 1837. Watercolor by the Bavarian captain Ludwig Köllnberger. There were at least two failed attempts to create a new town, the first in 1792 by bringing a population from Hydra and the second during the Greek War of Independence in 1825 by the installation of people from Psara, but it was not until 1829 that permanent habitation of the area was restarted. Piraeus at first developed into a small town with few dwellings, far from its glorious past as a prosperous city, with its population consisting largely of fishermen. The city of Piraeus and the church of Saint Spyridon; postcard of 1887. With the creation of the modern Greek state and the proclamation of Athens as its capital in 1832, the port, still named Πόρτο Λεόνε 'Porto Leone' or Πόρτο Δράκο 'Porto Draco', again acquired a reason for growth, and began to develop into a commercial and industrial centre. Migrants, mainly from the Aegean Islands, continued to arrive. A town plan was also drawn up and approved by King Otto, but not completely fulfilled, as it was revolutionary for its time. The municipality was established in 1835, reviving the ancient name 'Piraeus'. Following petitions from the new and emerging prosperous bourgeoisie, municipal elections were held to elect a mayor for the city, Kyriakos Serfiotis of Hydra. Piraeus had around 300 inhabitants at this time. Piraeus, from a deserted small town, quickly became the leading port and the second largest city in Greece, with its prime geographical location and closeness to the Greek capital helping it continually to grow, attracting people from across the country. A number of events contributed to the development of the city ; among these were its ultimate declaration as the leading port of Greece, the completion of the Athens-Piraeus Railway in 1869, the industrial development of the area in the 1860s, and the creation of the Corinth Canal in 1893, all of which left Piraeus more strategically important than ever. New buildings were constructed to cover the necessities of this growth, such as educational institutions, churches, the Stock Exchange Building, the Town Hall, the Central Market, the Post Office Building and charity institutions; the port was also supplemented and modernised, with dredging operations, the construction of the Royal Landing, the Troumba Pier and the quay-ways up to the Customs House area, the commencement of construction work on the Outer Moles and the completion of permanent dry-docks. At the end of the 19th century, Piraeus had a population of 51,020 people. The establishment of the Port Committee in 1911, which controlled the works of construction and maintenance of the port, and the Piraeus Port Authority in 1930, which made a more efficient job of managing a port slowly increasing in traffic, played a catalytic role in the city's development. The town flourished and neo-classical buildings were erected; one of them, which continues to ornament the present town, is the Pireaus Municipal Theatre, an excellent example of the area's once wider neoclassical architecture. After the decisive period for Greece of 1912–1922, Piraeus experienced a major demographic explosion, with its population almost doubling to reach 251,659 in 1928 from 133,482 in 1920, an increase owed to the arrival of Greek refugees from Asia Minor after the 1919–1922 Greco-Turkish War and the subsequent population exchange between Greece and Turkey. Although there was an increase in the labour force, a variety of social problems also emerged with the concentration of new populations in the suburbs of the old city, such as Nikaia, Keratsini, Drapetsona and Korydallos. The involvement of Greece in World War II came as a major setback to the city's progress. After the war, the city began its development once more, as damage to the port and the city were repaired and new additions took shape after 1955. Piraeus is now the third largest municipality in Greece; the city proper with its suburbs form the Piraeus urban area, which is incorporated in the Athens urban area, thus making Piraeus an integral part of the Greek capital. The port of Piraeus is now an important international port, and the largest in the country. 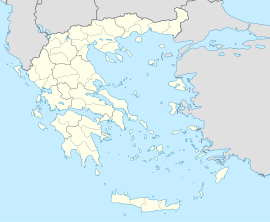 Piraeus is situated in the southwest part of the central plain of Attica, also widely known as the Athens or Attica Basin, which the Athens agglomeration (urban area) sprawls across. Piraeus is bounded by the Mount Aigaleo to the northwest, and the Saronic Gulf to the south and west, and connected with the rest of the Athens Urban Area to the east and northeast. The "city proper" of Piraeus consists of a rocky peninsula, originally an island, featuring three natural harbours. In addition to the central one, called Kantharos in ancient times, the smaller harbours to the east are still in use: Zea, also known as Pasalimani, and Munichia, the smallest of the three and widely known as Mikrolimano and Tourkolimano . Nowadays, the Greater Piraeus includes the harbours of Drapetsona, Keratsini and Perama. The central harbour is a hub of commercial and passenger shipping, whereas the two smaller ones cater to recreational and fishing craft as well as passenger hydrofoils. The municipality has an area of 10.865 km2. Under Köppen climate classification Piraeus has a hot semi-arid climate (BSh) according to the Hellenic National Meteorological Service data. Piraeus is the third most populous municipality in Greece with an official population of 163,688 (in 2011). The Greater Piraeus, part of the greater Athens Urban Area, comprises the city proper (municipality of Piraeus) and four other suburban municipalities, having a total population of 448,997 people (in 2011). The table below shows the historical population of Piraeus and Piraeus regional unit in recent times. Part of Eetioneia, the ancient gate to the harbour and part of the fortification of Piraeus, built during the Peloponnesian War. Among the archaeological sites of Piraeus, parts of the ancient Themistoclean Walls and Eetioneia, a mole in the entrance to the harbour, are still preserved in good condition. Excavations in Pasalimani revealed the Skeuotheke, an ancient structure where ship rigging equipment was stored, designed by architect Philon. In Kastella the Syrangion is to be found, which probably served as a sanctuary to the local hero Syrango, and the Cave of Arethusa, both prehistoric. Ruins of the ancient city at the basement of the cathedral of Agia Triada and the ancient Theater of Zea next to the Archaeological Museum, the ancient neosoikoi in Zea, Munichia and Kantharos navy yard, can also be seen. The discovery of four bronze statues at a construction site near the Tinaneios Gardens in Piraeus, Greece on July 18, 1959 is still remembered by an entire generation as a momentous discovery in Modern Greek archaeology. The statues are now featured in the Piraeus Museum, and are largely responsible for the creation of the modern Archaeological Museum of Piraeus. While drilling in order to lay pipes, the Hydrex Company came across the hand of a bronze kouros (youth) at a depth of approximately 1.50 meters. Excavations began after the custodian of the local museum, Dimitrios Kalantonis, and the Director of the Archaeological Service, Yiannis Papdimitriou, were informed. Four noteworthy bronze statues were uncovered in the continuing excavations – the Archaic Apollo (the kouros whose hand had originally been seen), the large Artemis, a smaller Artemis, and a larger-than-life Athena. However, the enthusiasm for the dig led to poor documentation of the details and context of the finds, leaving rare photos taken by the media or public as the only record. There are multiple theories as to how the statues came to be carefully arranged within what is thought to have been a small square room. When and why the statues were apparently hidden is open to debate, along with their origins, date, and style. One early theory suggests that the statues had been stored near the harbour with the intention of being shipped to Italy; however, the presence of coins near the statues dating from a period of war opens up another possibility – that the statues were hidden for safe keeping, and then lost when the building was destroyed. Dating the concealment of the statues is another issue, as they may have been buried anytime between the 1st century BC and the 3rd century AD. The statue of the kouros was recognized to be of Apollo, and dated to the 5th century BC. The other three female statues, from the 4th century BC, show a different, more human, form of sculpture that sets them apart from their older companion. The Veakeio Theater (former Skylitseio) on the hill of Kastella, with view to the Saronic Gulf, Mount Hymettus and the southeastern part of Athens. The city provides a wide variety of entertainment. Piraeus is famous for its tavernas and restaurants, renowned for their cuisine. Most are spread along the coasts of Mikrolimano and Piraiki, specializing in seafood and attracting many visitors, including tourists. The nightlife of the city is vibrant, with numerous bars and nightclubs. Plenty of major shopping areas can be found on the central avenues of Piraeus, Iroon Polytechneiou and Grigoriou Labraki. One of the most popular events in Piraeus is the Ecocinema International Film Festival, staged annually in late February. During this event, a number of films are screened at the Atticon Cinema and the Cineac Cinema, both of which are to be found within the city's Town Hall Square. In the summer, the Maritime Festival and the Piraeus Rock Wave Festival take place, while the Three Kings' Way Festival marks the beginning of the carnival, with all the associated costumes and entertainment. The Municipal Theater of city has been the center of the arts in Piraeus, hosting a variety of cultural events including theater, dance and music events. The open air Veakeio Theater in Kastella is a popular destination during the summer and hosts concerts, folk music bands and Greek and foreign troupes, while the Menandreio Theater, widely known as Delfinario, is popular for hosting variety shows. Village Park, a large multipurpose center and part of the Village Cinemas built in suburban Agios Ioannis Rentis, attracts a large number of people from the whole of Athens, offering a diversity of shops, cafes, and restaurant, in addition to the twenty cinemas making it the largest cinema complex in Greece. Next to it, the Allou Fun Park is the most recent and largest amusement theme park in Athens, offering its numerous rides and attractions, restaurants and pastry shops. External view of the Hellenic Maritime Museum in Freatida. Piraeus is home to several museums and other institutions of great interest within their field. The Archaeological Museum of Piraeus displays objects from classical antiquity found at the area of Piraeus and the greater coastal zone, typical of the history and culture of the ancient city. The city also houses the Hellenic Maritime Museum, with exhibits relating to the nautical tradition of Greece, the Merchant Shipping History Institute Exhibition, the Panos Aravantinos Decor Museum, the Georgios Averof Museum Ship and the Museum of Electric Railways, hosted in the Piraeus station. The Municipal Art Gallery and the Municipal Library, one of the largest in Greece, are also prominent within the culture of Piraeus. Traditionally, Piraeus has played a major role in Greek sport. The city boasts the most popular and one of the most prestigious Greek multisport clubs, Olympiacos CFP. The other major club is Ethnikos Piraeus, with a long athletic tradition, while other historic clubs are Atromitos Piraeus F.C. and Peiraikos Syndesmos. Others historic clubs from another city of Piraeus are Proodeftiki F.C. of Nikaia and Ionikos of Nikaia. In football, Olympiacos F.C. is the most successful football club in Greece, having won by far more titles than any other Greek football club, and its ground is at the Karaiskakis Stadium, in Neo Faliro. Ethnikos Piraeus F.C. had a longstanding presence in Super League Greece and also used the Karaiskakis Stadium as home ground, but in recent years the club has competed in lower divisions and currently plays home matches at the Helleniko Stadium, in Ellinikon. Proodeftiki F.C. of Nikaia had a longstanding presence in Super League Greece and also used the Karaiskakis Stadium as home ground, but currently uses as home ground the Municipal Stadium Nikaia. Ionikos of Nikaia had a longstanding presence in Super League Greece and its home ground is the Municipal Stadium Neapoli. In basketball, Olympiacos B.C. is the only major club from Piraeus, one of the most successful at domestic and European level, and its home arena is the Peace and Friendship Stadium, while the volleyball department of the same club, Olympiacos S.C., is the dominant domestically and has made great success in European competitions as well. Piraeus rides really high in water polo, where Ethnikos Piraeus and Olympiacos departments have entirely dominated in Greece; the first is considered the "Emperor" of the sport and the latter is the only Greek water polo club to have been crowned European Champion. First class sporting facilities can be found in Piraeus. The Karaiskakis Stadium, built in 1885 as a bicycle track, enlarged in 1964 and completely rebuilt in 2004, is the second largest football venue in Greece with a capacity of 33,334 and one of the most modern in Europe. It hosted the 1971 UEFA Cup Winners' Cup Final and several games of the football tournament in the 2004 Summer Olympics, while it was used as a velodrome in the 1896 Summer Olympics. The Peace and Friendship Stadium, part of the Faliro Coastal Zone Olympic Complex and built in 1985 opposite to the Karaiskakis Stadium, is the second largest indoor arena in the country and one of the most impressive around Europe, having hosted multiply major international events in several sports, including the volleyball tournament in the 2004 Athens Olympics, the 1998 FIBA World Championship, the EuroBasket 1987 and the Final Four of the Euroleague 1993. Akti Miaouli at the port. Inside view of Piraeus station, next to the seaport. In addition to being the largest marine–based shipping centre of Greece, Piraeus is also the commercial hub of Greek shipping, with most of Greece's shipowners basing their commercial operations there, largely centred around the street Akti Miaouli. In its capacities as host to Greek shipping, Piraeus has been affected significantly by the various governments of Greece. Following World War II, the Greek government attempted to nationalize the proceeds of the insurance payments given to Greek shipowners who had lost vessels as a result of those vessels having been commandeered by the Allied Forces; the insurance had been provided by Lloyd's of London and guaranteed by the coalition of the allied forces. Although Greek shipowners ultimately won their case against the Greek government in the British courts, most were uninterested in continuing to base their headquarters in Piraeus, both out of distrust of the Greek government, and because the war had left the greater Athens area in a state of severe poverty. As a result, Greece's shipowners left Piraeus en masse in favour of operations in London, New York, Alexandria and other major shipping cities. In 1967, when a group of colonels staged a coup d'état against the government, in order to increase desperately needed revenues, the junta offered lavish incentives for Greek shipowners to bring their companies back to Piraeus. This included both tax incentives and other inducements, as highlighted by the fact that Aristotle Onassis was allowed to purchase the entire island of Skorpios, which otherwise would have been a violation of Greek coastline laws. After the junta fell in 1974, the successive democratic government generally maintained the deregulation of Greek-based shipping, and many shipowners have maintained commercial operations there since. Today, however, as a result of traffic congestion plaguing the Athens area, and the fact that most shipowners reside in the lavish northern suburbs of Athens, many shipowners have opted once again to move their bases away from Piraeus to Northern Athens. Piraeus, nevertheless, is still a major centre for Greek and international shipping, and bi-annually acts as the focus for a major shipping convention, known as Posidonia, which attracts maritime industry professionals from all over the world. Piraeus today is one of the largest ports in Europe, and the annual number of 19 million passengers makes it the third largest worldwide in terms of passenger transportation. Piraeus is currently Greece's third-busiest port in terms of tons of goods transported, behind Aghioi Theodoroi and Thessaloniki. The central port serves ferry routes to almost every island in the eastern portion of Greece, the island of Crete, the Cyclades, the Dodecanese, and much of the northern and the eastern Aegean Sea, while the western part of the port is used for cargo services. Preserved vintage trolleybus of Piraeus-Kastella line. Piraeus is served by autobuses and trolleybuses (O.SY), Proastiakos, the Athens Metro (Line 1) and the Athens Tram. Piraeus station refers to the two railway termini located next to the seaport. The city of Piraeus is marked by the diversity of culture among its neighbourhoods. The hill of Kastella is one of the most prosperous and attractive neighbourhoods of the city, with a panoramic view over Athens and the Saronic Gulf. Its elegance comes from its numerous neo-classical mansions, while the Veakeio Theater and a church dedicated to the Prophet Elijah are the most popular buildings. The coastal area of Neo Faliro has been upgraded and is also prominent, with the Peace and Friendship Stadium and the Karaiskakis Stadium, an indoor arena and a football ground respectively lying opposite one another, predominating. Mikrolimano and Bay of Zea, the smaller harbours of the city, attract large numbers of visitors with their picturesque vistas and vigorous nightlife, hosting fishing boats as well as yachts and cruise ships. Kaminia, by contrast, is a working-class neighbourhood which still preserves the traditional look of an earlier period. The Municipal Theater in downtown Piraeus was built in 1885 and remains an impressive neo-classical building. Located across from the Neo-Byzantine Piraeus Cathedral, it forms one of the most renowned landmarks of the city and a popular meeting place. University of Piraeus main entrance. University of Piraeus, founded in 1938, operates four schools with more than 20,000 registered students. A modern copy of the "Piraeus Lion"
^ National Statistical Service of Greece (2002). Στατιστική Επετηρίδα της Ελλάδος 2002 (PDF) (in Greek). National Statistical Service of Greece. p. 54. The table includes the urban areas of Greece, officially defined by the National Statistical Service of Greece, powered by the Ministry of Finance of Greece. 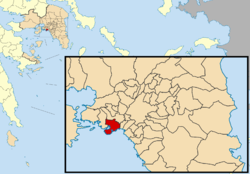 The municipality of Piraeus and its greater area belong to the Athens urban area (Πολεοδομικό Συγκρότημα Αθηνών), referred to as greater Athens. ^ "Presentation". www.olp.gr. Archived from the original on December 20, 2008. Retrieved 2008-12-27. ^ "Piraeus by Maritime Database". www.maritime-database.com. Retrieved 2008-12-27. ^ "ANEK Lines – Piraeus". www.anek.gr. Archived from the original on December 3, 2008. Retrieved 2008-12-27. ^ "Container terminal". www.olp.gr. Archived from the original on December 20, 2008. Retrieved 2008-12-27. ^ a b c "The Port of Piraeus Through The Ages". greece.org. Retrieved 2009-09-27. ^ a b Piraeus. The Port of Triremes. Hellenic Maritime Museum, Zea Harbour Project. 2016. Chisholm, Hugh, ed. (1911). "Peiraeus" . Encyclopædia Britannica. 21 (11th ed.). Cambridge University Press. p. 58. ^ Τα τείχη των Αθηνών (in Greek). National Hellenic Research Foundation. Retrieved 2009-09-27. ^ Kagan, Donald (2005). The Peloponnesian War. London: Harper Perennial. p. 96. ISBN 0-00-711506-7. ^ "Homogenization of mean monthly temperature series in Greece". International Journal of Climatology. Retrieved 2016-07-02. ^ Piraeus climate data (in Greek). Meteoclub. Retrieved 7 Jan 2018. ^ "World Gazetteer: Piraieús – profile of geographical entity including name variants". World Gazetteer. Archived from the original on 2009-07-29. Retrieved 2008-12-27. ^ "Piraeus Events, Festivals, Things to Do: Events in Piraeus Area, Greece". www.piraeus.world-guides.com. Retrieved 2008-12-29. ^ "Three King's Way Festival, Piraeus". www.planetware.com. Archived from the original on 2007-04-16. Retrieved 2008-12-29. ^ "Allou Fun Park". www.breathtakingathens.com. Retrieved 2008-12-30. ^ "Athens 21st Century – The Olympic Coastal Complex". athens-today.com. Retrieved 2008-12-28. ^ "Maritime transport - Goods (gross weight) - Annual data - All ports - by direction". Eurostat. 2010. Retrieved 2 December 2011. ^ "Baltimore City Mayor's Office of International and Immigrant Affairs – Sister Cities Program". Archived from the original on August 7, 2008. Retrieved 2009-07-18. ^ a b c d "Twinnings" (PDF). Central Union of Municipalities & Communities of Greece. Retrieved 2013-08-25. ^ "Batumi - Twin Towns & Sister Cities". Batumi City Hall. Archived from the original on 2012-05-04. Retrieved 2013-08-10. ^ "Marseille Official Website – Twin Cities". Ville de Marseille (in French). 2008. Archived from the original on October 24, 2008. Retrieved 2008-11-26. ^ "Saint Petersburg in figures – International and Interregional Ties". Saint Petersburg City Government. Archived from the original on 2009-02-24. Retrieved 2008-10-23. Warner, Rex; Finley, Moses I. (1972). History of the Peloponnesian War. Penguin Classics. ISBN 0-14-044039-9. Steinhauer, G. 2007. “The Piraeus bronze statues". In Great Moments in Greek Archaeology, edited by P. Valavanis, translated by D. Hardy, 326-31. Los Angeles: Getty Publications. Wikimedia Commons has media related to Piraeus. Wikivoyage has a travel guide for Piraeus. Look up Piraeus in Wiktionary, the free dictionary.